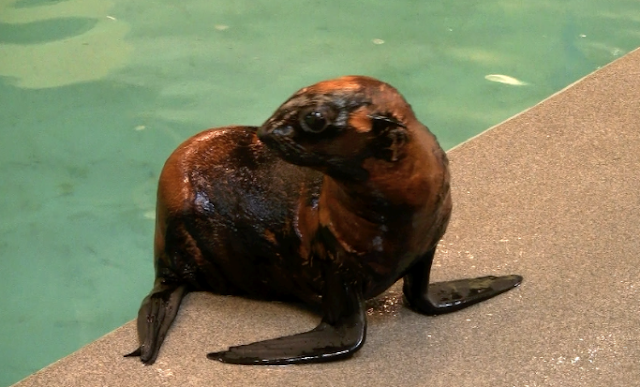 A new arrival at the Marine Mammal Center! The New Balance Foundation Marine Mammal Center is buzzing with hushed oohs and aahs these days. Behind the scenes, the marine mammal trainers are getting to know a tiny new arrival — a 10-month old Northern fur seal pup! Just a few months ago he was found in a tangle of seaweed on a beach in California, severely underweight and blind in one eye. His coat is in poor shape, mottled with orange under fur showing where his dark brown guard hairs should be. This means it would be hard for him to stay warm in chilly ocean waters. Fur seals are usually uniformly dark brown. This little guy has patches of his undercoat showing through. 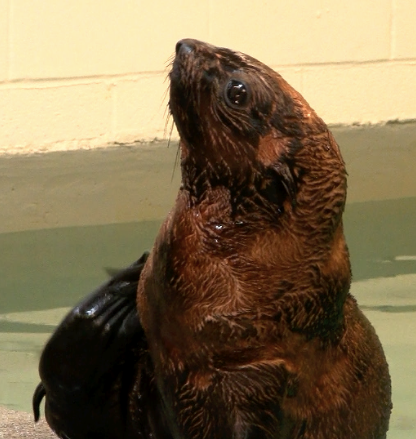 A marine mammal rescue program in Santa Barbara brought him in right away. After careful examination, it was determined that he could not survive in the wild so a call went out to find him a new home. Like a good fur seal, he spends a lot time grooming his thick fur coat. Fur seals are the second furriest animals on the planet with 300,000 hairs per square inch! With five other other fur seals for companions, the Aquarium stepped up to welcome this seal in need. The pup arrived at the Aquarium via FedEx on May 19, weighing about 20 pounds. He will remain behind the scenes so trainers can make sure he’s eating well and comfortable — standard quarantine procedure. He’ll join the rest of the colony on exhibit this summer! 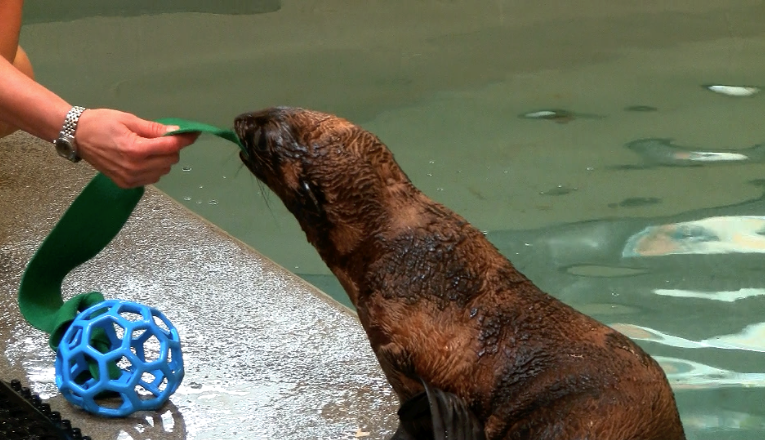 The addition of the young pup makes the New England Aquarium’s Northern fur seal colony the largest of any zoo or aquarium in North America. The little guy arrived without a proper name, so we held a naming contest. The contest is over now. Check back here to find out the winning moniker! Here's what some folks used as inspiration for our naming challenge: Fur seals can be found in the wild on Farallon, Channel, Pribilof and Aleutian islands. 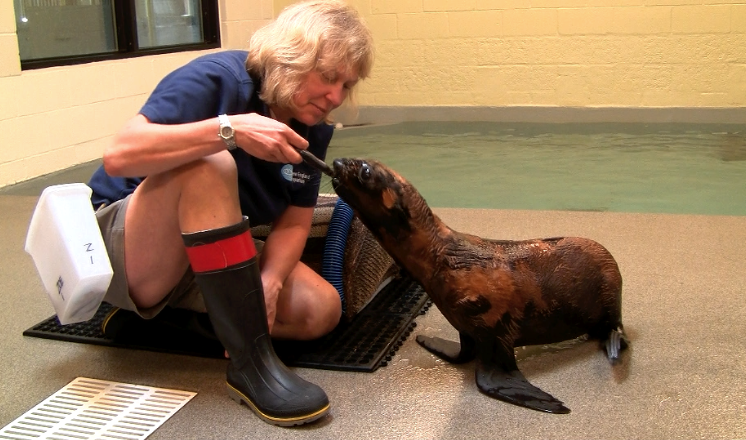 Delve in our trainers' fantastic blog posts for even more information about fur seals, their behaviors and more! Did you know fur seals are incredibly flexible? What do you think a fur seal sounds like when they wicker or give warning calls to eachother? Did you see our little friend on the news! Check out this story on Channel 4's website. He is so cute and small. It is really sad that he has a mottled coat and blind in one eye. But i am doing a report on Northern Fur Seals. Go NORTHERN FUR SEALS!!!!!!! !